I was performing keyword analysis for one of my new projects using SemRush.com, a competitive analysis tool. Actually, I was checking for how many keywords a website was ranking in Google. Domain authority, website age and other web metrics of that website were not that lucrative; so, my concept was if that site could easily rank in Google for some keywords, my new website would do so easily. SemRush.com gives the option to download the performed analysis in an Excel worksheet. Below, you’re seeing the sample of the data that I have downloaded. As I am planning an affiliate website to make, so I wanted to take only the buying keywords. So buying keywords have some patterns, in most cases buying keywords have these words as suffix or prefix: “Best”, “Reviews”, “Top”. If you observe the above worksheet data, you will find that some keywords have one of these words (best, reviews, top) in them and some don’t have. 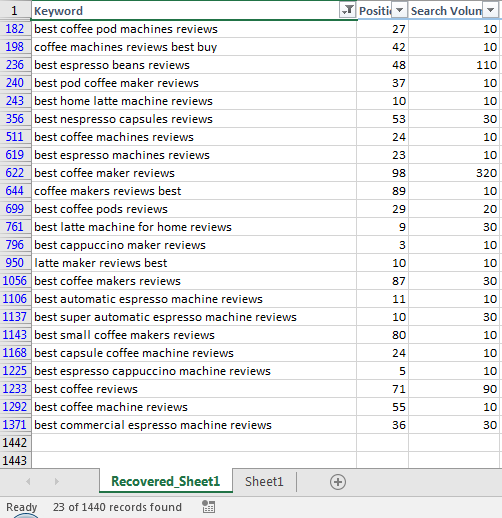 What I want to do is to show only the keywords that have “best”, “reviews”, and “top” from a list of total 1440 keywords (the data has total 1440 records). Let’s do that. Let’s filter this data for more than two words or texts. If I had to filter this data for one or two words/texts, I would at first convert this data into a table and then filter the table in the following way. Before advancing to the main article, I suggest you download the sample workbook that I have used to create this piece of content: Download www.espressogusto.com-url_organic-us.xlsx. 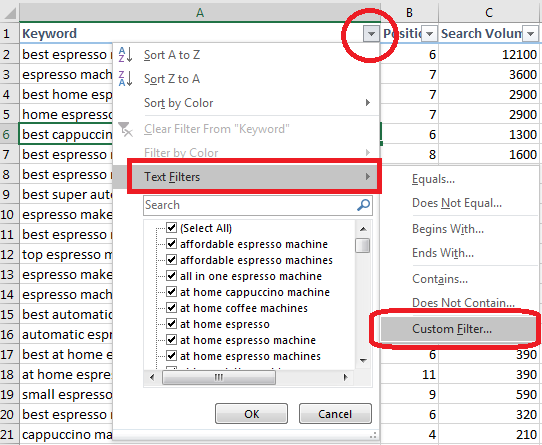 Here are the steps to filter a column for a specific word or text. Click on the Filtering icon at the top of column and type the word (I have typed “best”) in the Search field. Filtering data for one word. Click OK. You will get the filtered data like the image below. Filtered data for one word. 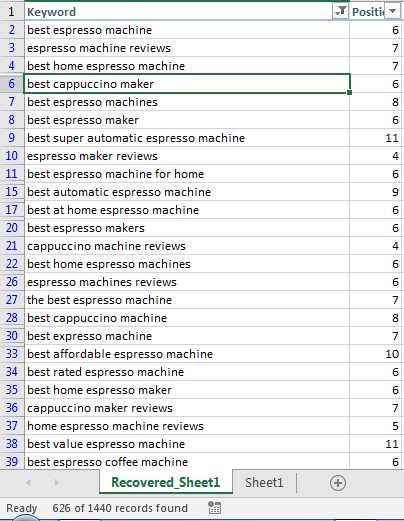 Check the filtered data carefully, notice that every keyword starts with word “best” . If you want to filter the data for two words, the above method will not work. But, using the same Filter icon, you can filter the data records for two words. This time, hover your mouse pointer over the Text Filters command in the drop down and then click on the Custom Filter command. Custom AutoFilter dialog will appear. In the dialog, you can filter a table for two words. In the first drop down, I select “contains”, and on the right side field, I type “best”. In the second drop down, I again select “contains”, and on the right side field, I type “reviews”. Now, you see there are two radio buttons in the dialog: “And” and “Or”. If you select “And”, then filtered keywords will have both the words “best” and “reviews”. Filter data for two words using “And”. Only 23 of 1440 records are found for this pattern. You check the keywords; all of them have both “best” and “reviews” words. In this case, the filtering criterion is: the keywords will contain both the words “best” and “reviews”. Check the filtered data carefully. All the keywords have both “best” and “reviews” text. Now see what happens when I select the “Or” radio button. Total 626 of 1440 records are found. These keywords might have “best”, or “reviews” or both “best” and “reviews”. 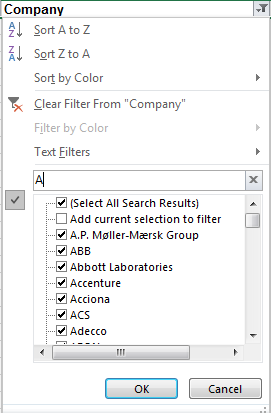 To analyze this combination of criteria, you can use Excel’s Advanced Filter dialog box (Data ribbon → “Sort & Filter” group of commands → Click on the Advanced command). Or you can copy the filtered data to a new location. In the List range field, input the data that you want to filter. In the Criteria range field, input the range where you have made your criteria. 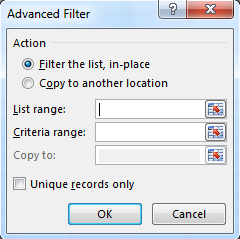 Copy to field is inactive (above image) because Filter the list, in-place option is selected above, if Copy to another location is selected, Copy to field will be active. Input a cell or the range into the Copy to field where you want to see the filtered data. If you want to see only the unique records, select the option: Unique records only. Before using Advanced Filter dialog, in a new worksheet, I create a range like seen in the image below. Check the image, I have set the words “best”, “reviews”, “review”, and “top” below the Keyword heading, then I have set Position less than or equal to 10, and Search Volume greater than or equal to 200 for every word. Now open the Advanced Filter dialog (Data ribbon ” Sort & Filter group of commands) and click on the Advanced command. Advanced Filter dialog box will appear. 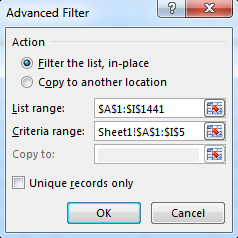 In the Advanced Filter dialog, as List Range, I set the whole range: $A$1: $I$1441, as the Criteria range, I set the range from Sheet1 ($A$1: $I$5). If you click OK, you will get only 17 records. Filtered data with multiple criteria. Check the filtered data one by one (in the image above). 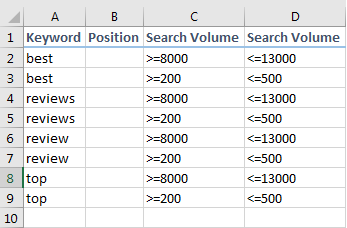 You see that the Keywords must start with either “best”, “reviews”, “review”, or “top” words; no values in the Position column is greater than 10, and no values in the Search Volume column is less than 200. You know what intervals are? 1 – 5, 8- 15; these are intervals. Want to filter a column for different intervals? 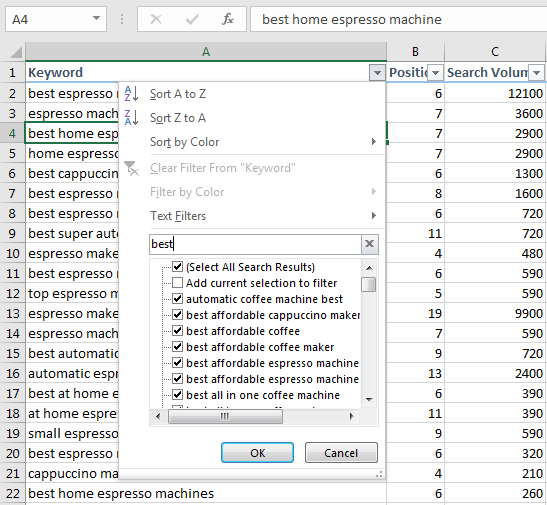 Say, you want to filter the Search Volume column for two intervals: 8000 – 13000 and 200 – 500 with Keyword column filtering for texts “best”, “review”, “reviews” and “top”. You will make the Criteria range like the following image. 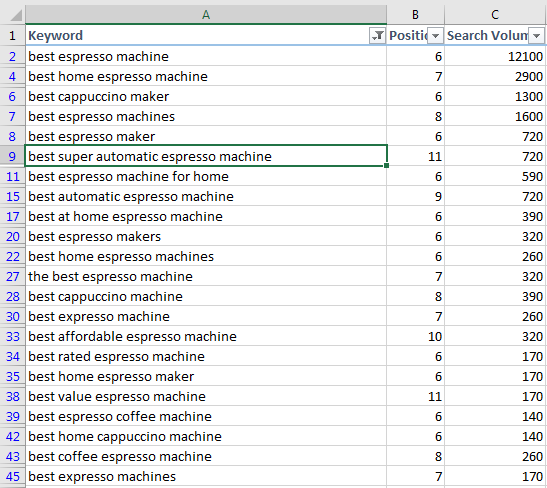 You see that I have made a duplicate of Search Volume column at the right side of the criteria range. For every filtering text, I have made two intervals: 5000 – 13000 and 200 – 500. And here is the result when I perform the filtering using Advanced Filter dialog box. Only 29 records fall into these criteria. Check every row. All the keywords have either “best”, “reviews”, “review” or “top” words, and search volume values are either between 8000 – 13000 or 200 – 500 intervals. So that’s the beauty of using Advanced Filter dialog box. Now, think about a complex situation. You want to see only the search volume higher than 2 times of the average search volume. No way, you can do this filtering without a formula. The formula will use the relative reference to refer to the first cells of the columns, the columns on which you are applying the formula for filtering. Other references in the formula will be absolute references. To list the formula, make a new column in the Criteria range. You can use any heading (I have used “Formula”), even you can use no heading, for no heading, keep a blank space in the place of heading. If you check the formula that I have made (above image) you will find that I will filter the Search Volume column using this formula. Because I have used relative reference C2 in the formula. The other references are absolute references ($C$2: $C$1441). The formula returns a TRUE value. Here is an important thing you should remember. All the four formulas are identical because every criterion in the Criteria range works independently. So, the result will be like: if a Keyword value has “best”, “reviews”, “review” or “top” texts, and for that keyword if the search volume is greater than 2 times of the average search volume, the records will show then. The result shows only the Search Volumes that are higher than 2 times of the average search volume. On the right side of the worksheet, you’re seeing the average of the Search Volume is 188. So, this is just one example of using a formula to filter a data set. Sometimes you will come across situations where using wildcard characters (?, *, and ~) will save your time. Before showing you how wildcards can become a handy tool for you, I want to give you the idea how to use these characters. The table below shows a brief introduction of the characters.
? Any single character. “Wor?” and “Wor?” both will represent the words “Work” and “Word”. * Any number of characters “North*” will represent words “North-South”, “North East”, “Northeast”, and “Northwest”. ~ Wildcard characters in text “Excel~*” will find “Excel* worksheet”, “Excel* Sheet”. “Excel~~” will find “Excel~ worksheet”, “Excel~ sheet”. 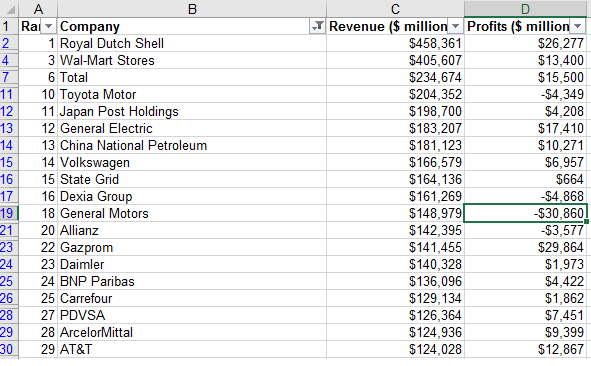 Below, you are seeing the list of Fortune G500 companies (a tiny part of a list of total 500 companies). From here, download the complete file. I am using the Fortune G500 worksheet of this file. 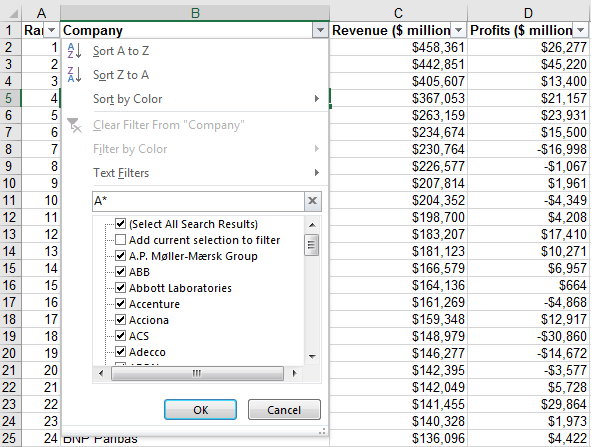 Consider a type of filtering: you want to show only the companies that start with letter “A”. The data will be in Filtering mode. Click on the Filtering icon at the top of the column and type “A*” in the Search field. Filtered data with wildcard (*). Do you think you will get the same result just typing “A” in the Search field? Here is the result of that thinking. 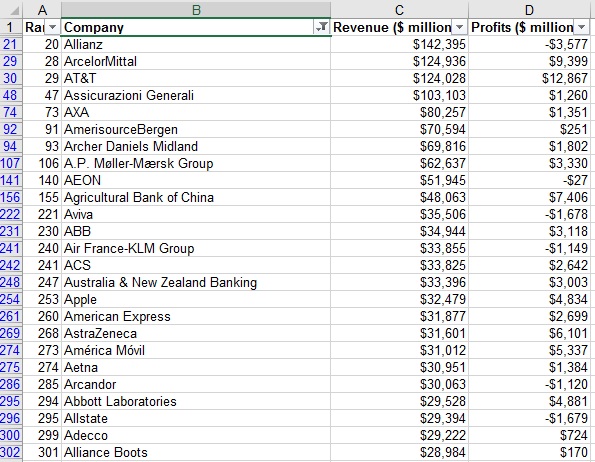 The filtered data is showing all the companies that have “A” in their text, not only the companies that start with “A”. So using wildcard characters, you can filter data in some unique ways. Nicely done, but I think there should be a clarification on the “Formula” section; you don’t put the formula in the first cell in the “Formula” column and drag down, but instead put the identical formula in each cell of the “Formula” column. I was getting wonky results until I realized that. After filtering using Advanced Filter i have got the empty field.. Your answer would be really helpful!! Your blog is a marvel. Nevertheless I miss the opportunity to download , lets say above instructions and teaching for later ealuation together with the example file. Is it possible to also invent a pdf file for download ? I live in the remote Philippines and internet access or solid internet is, well, sometimes a game…..So it would be helpful if one can review your articles offline. Copy/paste seems not the best idea or is it?